Northwest National Real Estate: Price Reduction! Custom Rancher With Lake View! Price Reduction! Custom Rancher With Lake View! Must see lake view custom rancher that is priced to sell! This home boasts granite counter tops, hardwood floor, double oven, 2 plus car garage, heated 24 x 40 RV shop, radiant heat and much more! Back- up generator that will have your power back on in minutes. In addition you have the benefits of private marina, private airstrip and maintained roads. 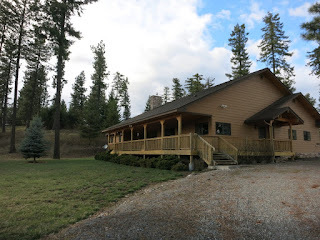 Are you ready to enjoy evenings watching the sunset over Coeur d'Alene Lake from this comfortable covered porch? Contact office for more information (208) 245-4502. Priced at $374,000.